Four-color process printed on Side 1 of 14pt C1S White Semi-Gloss stock. Coated with Aqueous Gloss. 3RD HOME's front panel features a picturesque patio with palm trees and a sparkling pool. 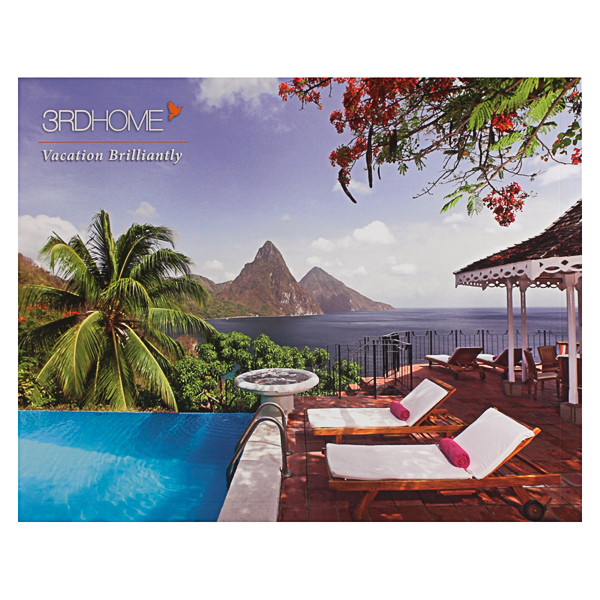 The scene represents the luxury resorts 3RD HOME members can visit in exchange for letting others stay in their vacation homes. White space on the back emphasizes the cliffside photo and its lush vegetation. An orange banner highlights the brand's tagline, while contact information is written in pale gray on the flap for a light, modern style. 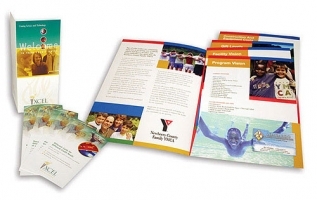 Ship a 9" x 12" folder or presentation packet with this handy product. Expansion scores accommodate a stack of materials up to 3/4" thick. This means no more shipping packets one piece at a time; all of your vital documents fit in one place. A nylon strip seals the pocket shut until the recipient tears it open. Its landscape orientation turns the exterior into a wide design canvas; adorn it with colorful imagery, stylized brand elements, or small items like contact information. Dimension Closed: 12 1/4" x 9 3/4"
Dimension Open: 12 1/4" x 12 1/4"